The firm PATENTUS was recommended by the catalogue in the category “Litigation” (recommended), and was in the third leading group in the category “Prosecution” (bronze band). As per IAM Patent 1000, the client verdict on PATENTUS team was as follows: “Very devoted, knowledgeable, responsive and effective”. “Collaboration with the group is tremendously fruitful, as it provides cost-effective solutions”. The following representatives were singled out for individual recommendations: Dmitry Markanov in the category “Litigation” and Alexey Mikhailov in the category “Prosecution”. “Robust enforcer, Dmitry Markanov, provides clear legal and business visions, and his effective negotiation skills achieve successful results”. Head of patents Alexey Mikhailov was announced one of the country’s top individual filers, the “highly active and talented professional” has handled “numerous interesting cases”. 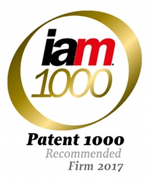 IAM Patent 1000 is a unique guide that identifies the top patent professionals in key jurisdictions around the globe based of the feedback received from those operating in the market, analysis of the performed projects and clients’ feedback. This rating is a result of a five months’ researching process. The IAM team conducts in the region of 1,800 interviews with numerous patent attorneys, attorneys at law and in-house counsels to gather market intelligence in each country. Thus only those individuals identified for their exceptional skill sets and profound insights into patent matters are included in the ranking.